(a) and (b): The Gross Value Added (GVA) at basic prices is the sum of compensation of employees including social contributions made by the employer (CE), operating Surplus and mixed income of the self-employed (OS/MI), consumption of fixed capital (CFC) and taxes net of subsidies on production. The share of compensation of employees stood at 33.6 per cent in the year 2014-15 (the latest year for which information is available), increasing from 32.9 per cent in 2012-13. Simultaneously, the growth rate of GVA at constant basic prices increased from 5.4 per cent in 2012-13 to 7.1 per cent in 2014-15. Among the broad sectors, public administration & defence had the highest share of compensation of employees, i.e., 85.0 per cent of the GVA at basic prices, in 2014-15. Higher wages/compensation of employees may have an impact on private final consumption and hence on GDP growth. At the same time, higher wages in public administration & defence may place added demand on the budgetary resources of the Government. 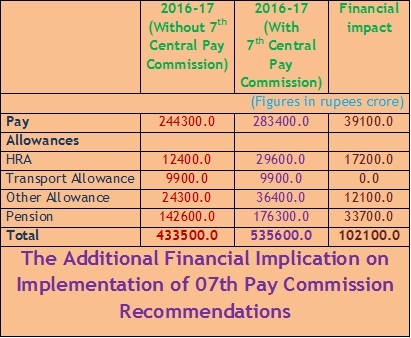 On account of this possible two-way relationship, it is difficult to exactly calculate the GDP growth required to sustain the higher wage bill.